I’m going to estimate that about 8 tags are gone from the flyer. Assume individuals taking tags were unique — nobody took more than one. Assume that about 25% of those suffering from schizophrenia or bipolar disorder would consider participating in the study, seriously enough to take a tag. 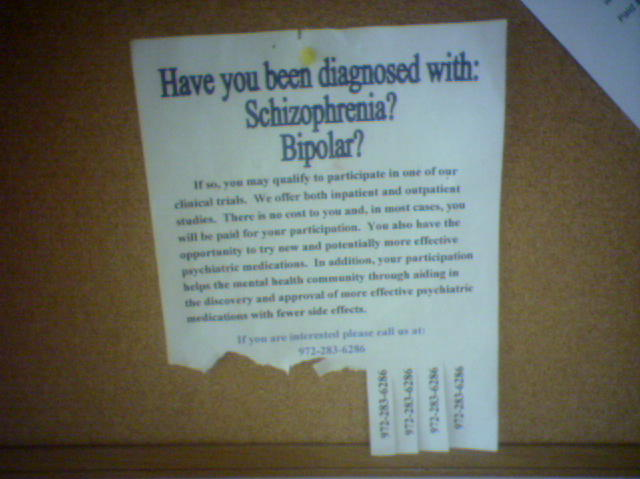 Assume that about 10% of the building has been to this one breakroom since the study flyer has been posted, AND read the flyer. OK, so 8 / .25 = 32. 32 / .10 = 320. 6 / .15 = 40. The prevalence rate of schizophrenia (1.1%) and bipolar disorder (1.2%) in the general population are relatively low. Based on observations of parking garage capacity and activity, I estimate there are at least 750 people in the building. Even by this conservative estimate, forty schizophrenic / bipolar patients out of 750 total workers works out to about 5.3%, over twice the prevalence in the general population. I label this as strong support for my hypothesis that corporate America can be a terribly confusing and depressing place to work. Also, although I have secretly suspected it for some time, I now have empirical evidence that I’m surrounded by the mentally ill at work. Hope this gives everyone a good laugh today… enjoy!